The paper deals with the issues concerning stand development and methods of carrying out experimental equal channel angular pressing AD0 aluminum alloy blanks. Research on the effect of equipment heating temperature on the energy-power costs, when pressed, is considered as well. The experimental pressing of blanks of 40 mm length and 5.5 mm square section is performed under the following process parameters: channel intersection angle Ф=120 °, channel crossing radius r=3 mm, equipment temperature θ = 20-200 ° C, pressing speed v= 10 mm/s. The experiments have provided data on the changes in power parameters pressing process. Pressing process characteristics are based on the analysis of force change chart. The blank temperature has a significant effect on the pressing force. Keywords: equal channel angular pressing, intensive plastic deformation, energy-power costs, temperature. Valiev R.Z., Aleksandrov I.V. Bulk nanostructured metallic materials: preparation, structure and properties. – Moscow: ICC Akademkniga, 2007. – 398 p.
Dobatkin S.V. Mechanical properties of ultrafine-grained aluminium alloys and potentialities of their usage // Technology of light alloys, 2011, №3. – P. 5-17. 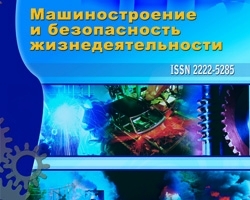 Aborkin A.V., Babin D.M., Elkin A.I., №3 (17) 2013, Stand development and experimental research of the process of equal channel angular pressing aluminum alloy blanks, Zaharov A.A.